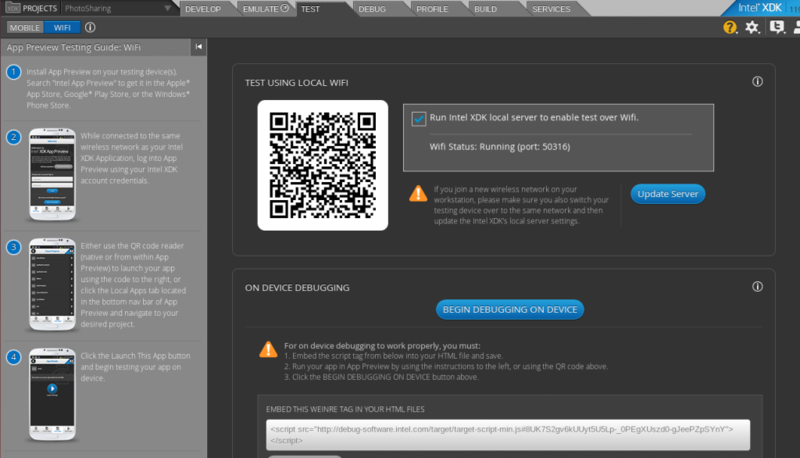 Intel XDK is a new tool for developing cross platform mobile applications. It attempts to keep the process simple by including all possible target platforms in one package and collecting several tools that may be familiar and useful to you. 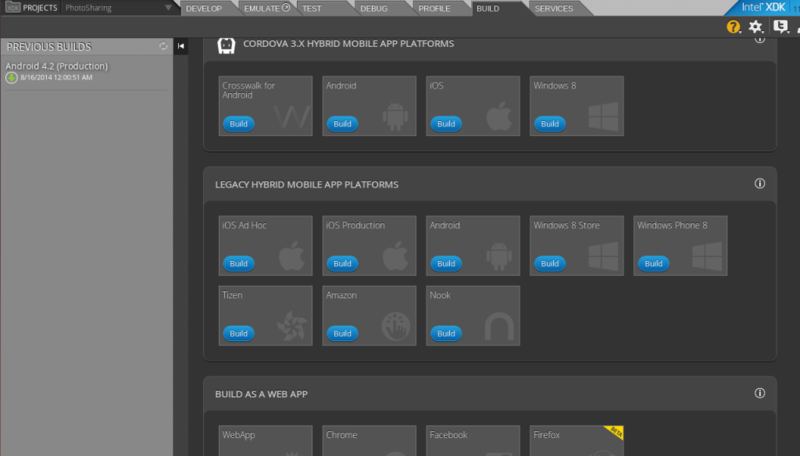 In this article I will explain what Intel XDK is and prepare you to start building an app for every mobile platform using HTML5. The interface is easy but different from other IDEs. We will explore everything step by step. You can find Intel XDK at the official web site. It is available for Windows, Linux and Mac. When you first start the Software you will need to create an account so that you can use the build features. With this service you can host your projects in the Cloud and build them from there. After creating an account, sign in and you are ready to start with it. NOTE:I encountered some problems when trying to install Intel XDK on Debian. On Ubuntu which is Debian based it performs well. I haven’t tried it yet with other Linux distros but leave a comment if you find any problems. What I like the most about the XDK IDE is that it includes all the tools to fully develop an app from start to publishing. Development, Emulation, Testing, Debugging, Profiling and Building are all included. There is also a special feature for third party Services. All of this workflow is organized into 7 tabs that are in an appropriate order. The development tab is where you are going to spend the most of your time. You can develop your app using the drag and drop tools (App Designer and App Starter) or the text editor. The text editor is based on Bracket editor which is an open source editor build using HTML5. Bracket is maintained by Adobe. 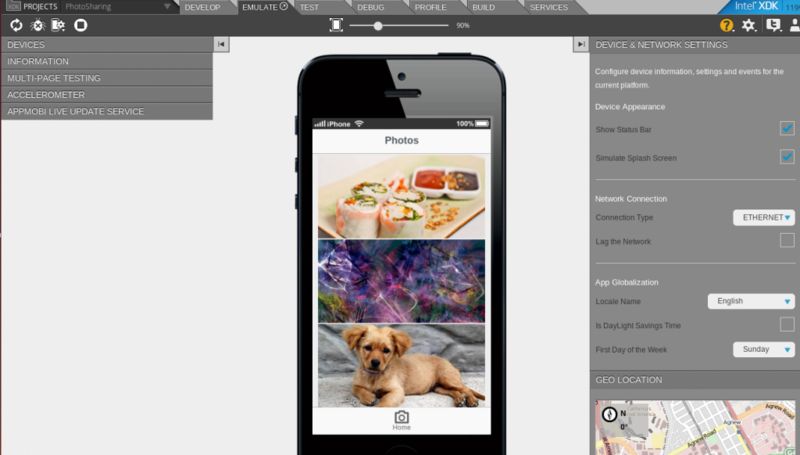 For the drag and drop prototyping you can choose App Designer or App Starter. App Starter is a simple tool and is aimed for beginners. It only supports the App Framework. App Designer is a more complex tool than App Starter with more features. It supports App Framework, Bootstrap 3, JQuery Mobile and TopCoat. 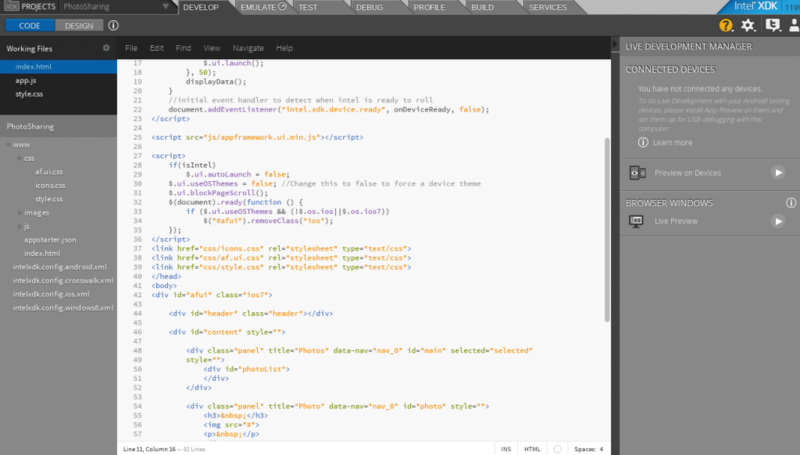 When developing with the drag and drop tools and the code editor, you can switch back and fourth. You can also use both of them side by side. I personally choose not to use the GUI building tools as they produce too much unnecessary code. I like to code everything from scratch as the whole project is more maintainable and your code is cleaner when you code from scratch. One feature that I love to play with is the live preview on device, you can easily code and preview live on a connected device. The second tab is the Emulate tab. The emulator is based on Apache Ripple. It is a kind of Chrome Browser plus some extra APIs, it supports Cordova and Intel XDK Apis. Testing for different screen sizes and different devices is really easy with this tool as you can choose from a wide variety of devices. Intel integrated the Chrome Developer Tools for real time debugging and inspection of your front end. It’s much like the live preview on the develop tab but here you can deal with a hardware emulator. The profile tab is also only available for Android 4.x devices. In this tab you can collect information on app performance. Intel XDK supports building for Android, iOS, Windows 8, Windows 8 Phone, Tizen, Firefox OS (beta) and Amazon apps. It also supports building Facebook and Chrome Web Apps. Building is the easiest part. All you have to do is configure some information about the app. Different platforms have different configuration requirements. For example iOS requires some information about your iOS developer account. What I like about building apps in Intel XDK is that it offers unlimited private projects. Phonegap only gives you free cloud building limited to 5 private projects. The last tab is the Service tab. In this tab you will see a list of various additional services. Advertising, Data Feeds, Notifications and Social. All these services are external to Intel XDK and they can be used under all platforms. Let’s say for example we want push notifications in our application. We can use the AppMobi PushMobi service. Or maybe we want to regular update the application, we can implement Live Update by App Mobi. Or we want to use Dropbox Api, also easy to do. HTML5 is getting stronger every day as a viable option for mobile app development. Every day new tools and new companies are helping this trend. One of the most prestigious tech companies in the world (Intel) has now invested in hybrid mobile applications. This is a huge investment of faith in HTML5 technology. Building hybrid applications is already easy, Intel XDK makes it even easier as it has all you need for developing an mobile app in one place. In a future article I’ll be showing you the frameworks we can choose to start a project and start building a simple app.